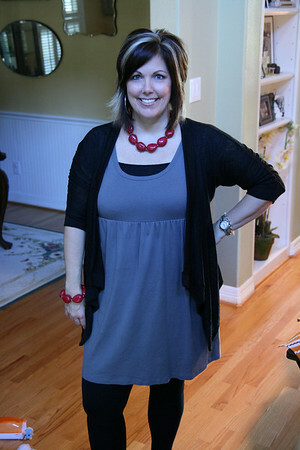 Can you believe it's time for another installment of What I Wore Wednesday? I'm sure you've been waiting anxiously, perched on the edge of your seat to see what I've been wearing lately. Why yes, those are Annelise's legs poking out behind me, it seems one or two of her Zhu-Zhus were making a break for freedom and she had to stop them right that very minute. Okay, this next outfit is outside my normal fashion box, but I am trying to embrace the legging/dress/tunic look. Even though I must confess I have not worn leggings since 1993 and was rather relieved to let them fade away into the fashion sunset then. 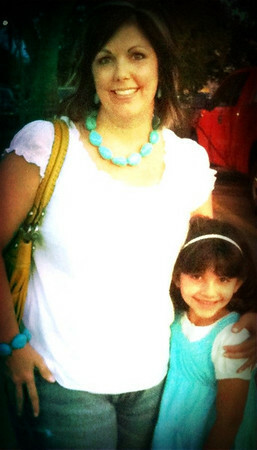 And even though I'm 41, I think they look cute with dresses, long tunics, sweaters, etc. Feel free to stage an intervention. Since fall in south Texas is a fickle tease, I only wore the cardigan for about 15 minutes before I feared heat exhaustion would set in. Apparently I could not be bothered to tuck my t-shirt in completely, thinking a corner would suffice. And I'll also tell you that this downward camera angle is my favorite because it's so misleading and distorted. I'd feel much better about the whole legging dilemma if this angle were really true. 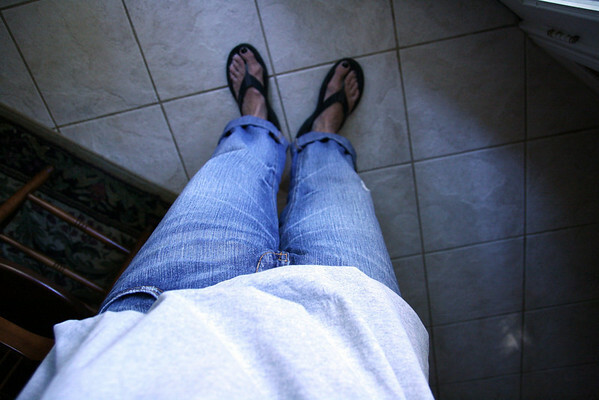 *I'm still a fan of greys and neutrals, comfortable clothes, splashes of color, flip-flops almost year round and distressed jeans. 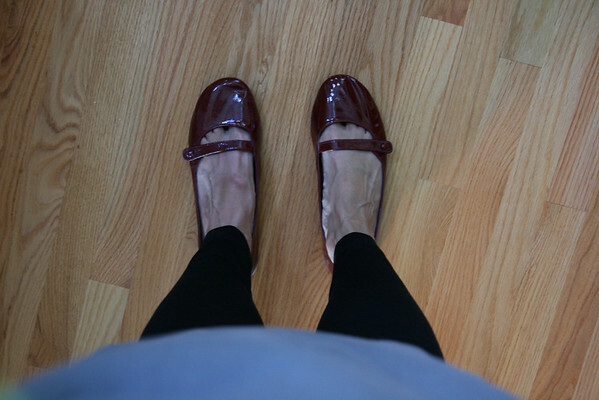 *I'm really jonesing for leopard print ballet flats and yellow ballet flats. I can't explain why. *I can't wait to wear cute scarves without fear of heat stroke. 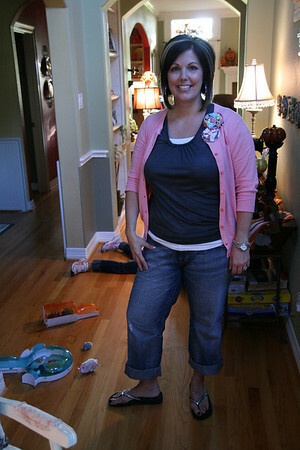 Be sure to visit The Pleated Poppy to see what other ladies/stay-at-home-mamas are wearing in this week's WIWW linky party. Too cute. I love the leggings. I totally have those red shoes and I am now inspire to go put them on for today! You're rockin' those leggings! They're super cozy, right? I think the tunic/dress and leggings is so cute, especially with the drapy cardigan and chunky jewelry. Also LOVE the posies! love the leggings! not ready to go there myself...plus, they're not super warm waaaay up north. canada is no texas! You look great in all of these ensembles! I'm so glad you said that you could only wear the cardigan for 15 minutes before suffering heat stroke because I was thinking how cute they all are, but wondering how you don't overheat. I would like to be able to layer more, but I'm always too hot. Looking good lady! Clearly I need to get to Kohls for some awesome accessories. I LOVE leggings and I think they look good on you. I like all the outfits. I want to try the leggings and tunic look too. I have yet to find flats that I like though, so I have a shoe dilemma (no extra money for flat boots unfortunately). I want to go shopping. I'm pretty sure I have the same exact outfit as your #3 ;-) also I must have the red patent flats from Payless... you look adorable, as always! your accessories rock! You look super cute! Can we trade closets? Thanks for stopping by my blog. Hope to see you again for more WIWW fun! You look adorable, and I am loving your style! visiting from The Pleated Poppy, you are adorable! And the leggings are a go! !